How does the Hotel Oakland Village help residents with their health & well-being? 1. The 15 Village Health Education Programs that educate residents on many health topics relating to seniors and to fight the negative health impact of isolation among seniors. Benefits residents in Phases 1, 2, & 3. 2. The Village Health & Wellness Connection Built on the foundation of the Health Groups, this program has almost 100% resident participation. The Wellness “Connection” provides each resident with a free, custom, interactive Wellness Plan that “connects” the resident to all of the free on-site health & wellness services that include Independent Living, Assisted Living level, and Nursing Home level care. Benefits residents in Phases 1, 2, & 3. 3. 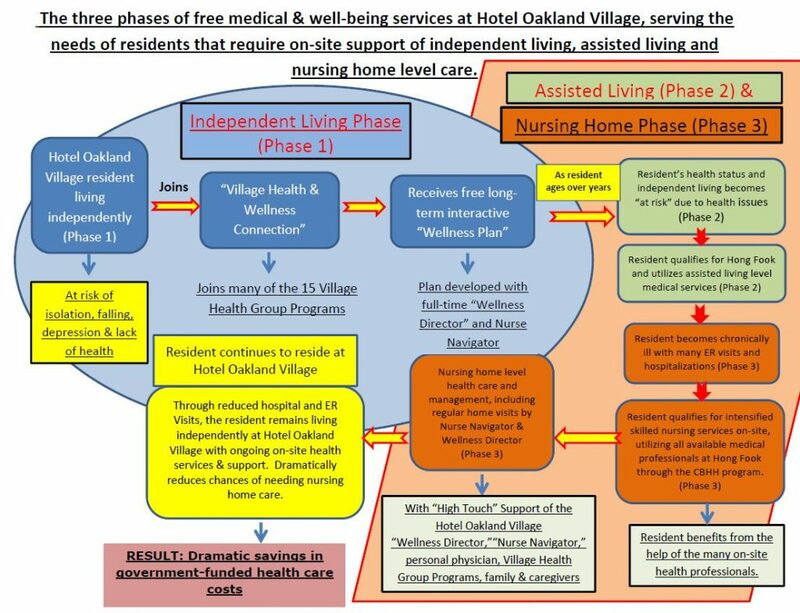 Hong Fook – on-site Adult Day Health Care Center (Community-Based Adult Services (CBAS): Phase 2 provides Assisted Living and skilled nursing level care to frail Hotel Oakland Village residents that are at risk to be admitted to nursing homes. The Wellness Director and the Nurse Navigator provide “early detection” of residents who have had a change in health status and facilitate their going to Phase 2. Benefits residents in Phase 2 & 3. 4. Community-Based Health Home (CBHH) at Hong Fook: Phase 3 offers skilled nursing level care that is more comprehensive than the typical medical services available at nursing homes. This unique program includes the services of a Nurse Navigator and the Hong Fook medical staff that specifically make home, hospital and nursing home visits. The Nurse Navigator also accompanies the resident to doctor appointments and follows a detailed preventive plan to keep the resident out of the ER and hospital. Hotel Oakland Village is the only senior community in Oakland to provide this free, enhanced medical care to all Hotel Oakland Village residents. 5. Social & Wellness Services provided at Hotel Oakland Village are extensive and available through the direction of our full-time staff. Benefits residents in Phases 1, 2, & 3. ← Touching story about ending senior isolation!